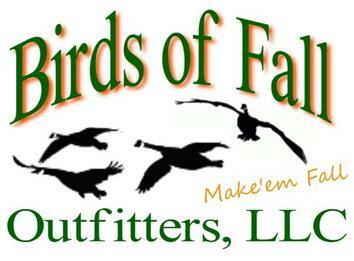 Birds of Fall Outfitters, LLC is located in Northern Colorado, one of the most scenic areas in Colorado. We are family owned and operated by a husband and wife team. We have prime waterfowl hunting locations from North of Wellington to South of Greeley. We have exclusive hunting rights on all our properties. Our properties are managed and controlled by the Birds of Fall Outfitters to insure you have a quality hunt every time out. By managing and controlling the properties we keep the pressure off the birds and give them time to be comfortable in our locations. Steve Lutz Jr, owner and guide, was born and raised in Windsor and has hunted along the Colorado Front Range since he was 8 years old. He has guided for many outfitters along the front range and has seen many changes to the flyway over the years. After operating a sucessful goose and duck hunting club for over 10 years, it is now time to expand into the outfitting world. With beautiful views and plenty of birds, Colorado is a must hunt destination for any waterfowl hunter. Our state holds a local population of geese that numbers around 20,000. When you factor in the migration that funnels down the Rocky Mountains, our wintering population will reach upwards of 290,000 geese. With plenty of birds, excellent locations and guides that have over 50 years of guiding experience, we are sure you will have a true waterfowl hunt of a lifetime. A GREAT view from our pit!!!! So much fun. "Great hunt with Birds of Fall Outfitters!! Steve is by far the best goose caller I have ever heard--he talked a goose into landing on my buddy's head--no joke!!! Thank you-I will be booking again!!"